Prep & Pantry uses a dedicated online database of over 1 million items encompassing a wide variety of international products using the EAN-13, UPC-A, and UPC-E barcodes! Make sure that when you enter an item barcode manually that you include those numbers "outside" the barcode. In the UPC-A example above that would be the zero to the left of the barcode and the seven to the right. Also, no spaces. The number you enter should appear similar to one the blue numbers in the barcode example above. Every time you scan or manually enter a barcode you will see one of three messages -"Success! 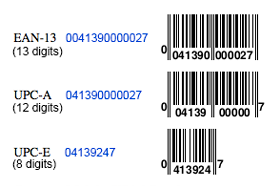 ", "Item not found", or "Barcode is not UPC/EAN". If you are not seeing one of these messages and you have a working internet connection, it means that the Automatic UPC Lookup is not enabled. Automatic UPC lookup is enabled by default, but if you recently upgraded versions and it doesn't seem to be working, you should double check the settings. Go to the Settings tab> UPC Lookup. Even if the switch shows ON, tap it once to OFF, then once again back to ON. Occasionally on version upgrades the automatic setting doesn't fully engage and doing this resets it. Every Item I Scan Returns "Item not found"! While the database does contain over 1M items, it is not all food items. Nor is it guaranteed that every item you scan will be found. Sometimes it will seem as though "nothing" is being found. There are gaps in the database but there IS better product coverage for more countries than any of the other databases researched. The intention is that this database is a good starting point to grow from, for everyone. The goal is, with the upcoming Prep & Pantry version 2.1, to do what is called "crowdsourcing". This is where we all will have an opportunity to help each other out. In v2.1 there will be the option to submit items to the database that were not found with the automatic lookup. It is expected that those gaps will be filled quickly with this approach and the information will be acutely relevant to the users or Prep & Pantry.